Below is a ten minute chat via facebook with artist Brynna Kate Tucker who is showing at the Fountain Art Fair for Art Basel. Thanks for the idea James. This was much easier via a chat. Hope some of you can make it down there. It starts December 4th through the 7th. when do you want to do the chat interview? i have to go in a bit. thanks for being into it. maybe later tonight is good for me. I have a few minutes now, will that work? let’s make an art project out of it. i have to leave at nooon. alright. i’ll post the entire chat. so no worries about typos. it’s kinda new and I have a lot of stuff i haven’t uploaded yet, but it’s what I’ve got for now. I actually used to work with jenny walty (one of the founders) at Art in General, and she invited me to be involved. sweet. She’s great. I knew her years ago and Patrick. interesting web of friends they have woven. your work is of walls, and such. patterns, textures you take off the street is that correct? I started doing street photography only recently. I saw on your web site you started doing street photography after grad school. Yes, please explain the work if you feel up to it. what were you doing before. installations? What program were you in for grad school? the work started because when I finished grad school, I had this huge body of work – but no job. It was right after 9/11 – so it was hard to find work. I ended up having to give up my apartment, and eventually my storage space. No space = No art objects. I went in the Army after 9/11. Not sure I would have if I could have found work. I mean I wanted to be a patriot but finding work was ridiculous. What type of art objects were you making back then? I eventually got a bit more settled, but had this strange sense of insecurity that lead me to stop making objects that had to be stored. Do they have any bearing on your current work. Gotcha. So you store them digitally now though correct? I was making small objects in large quantities, then waiting for a space to install them. What type of small objects? The work I’m doing now has the same type of accumulation, but they accumulate as part of a project or series, rather than as one larger work of art. I used a lot of fibers – raw papers, flax, cotton, silk… etc. I think it’s so beautiful. Why do you feel it’s beautiful? When did you begin to feel that way? It makes the city seem more human. Like the city is alive maybe? That, and that the city is imperfect like we all are. Just kidding. I hear you. Interesting. So it’s sort of an inner reflection. So what are you showing at Open Ground in Basel? Will you be there the whole four days? Oh, what did you go to grad school for? yes, but an inner reflection using superficial means materials and concepts. Are you living in the city or close by? 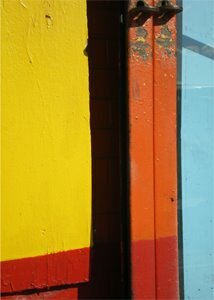 I am showing 12 photos at Fountain – a series I’m calling Color Fields, City Blocks. Interesting. Like you are looking outward and thinking how that outward environment is similar to us all. A symbiosis of sorts. Amazing. I can only be there Saturday and Sunday. You’re so lucky. Connectivity – yes, but also it’s intended to have a sense of humor. Well that’s sort of like being a neurologist or something isn’t it. I feel honored to be chatting with you. Wow. Again. very honored. So. Listen our ten minute chat project is up. Do you feel good about it? Hopefully I’ll see you in Miami soon. Looking forward to meeting you. My previous series of work was called Cracks in the Concrete Jungle and it was unsolicited repairs done throughout the city with soap – so it wouldn’t actually fix anything, but would look better. Interesting project. Thanks for doing this. See you soon. Cheers.